The holarchy of StoryAlity Theory. Lots of smaller ideas that combine to make a whole new idea. 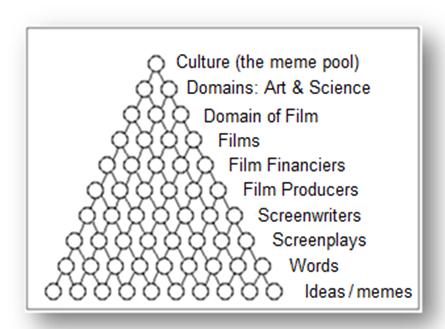 So, in one way, StoryAlity Theory (derived from a study of the top 20 RoI Feature Films) is really simple. At its simplest, it means: Just make a movie that a lot of people will like. But – there are many component ideas (or, memes) that make up the Theory. Here’s what it looks like, as a holarchy of ideas (concepts). Next Question: What’s a holarchy? A: A holarchy is a special kind of hierarchy. It’s an idea from Arthur Koestler (1964, 1967, 1978). (So, an idea – as a holon-parton – is a whole idea, but it’s also part of a bigger idea.) In Biology, systems are holon-partons. You are a holon-parton. 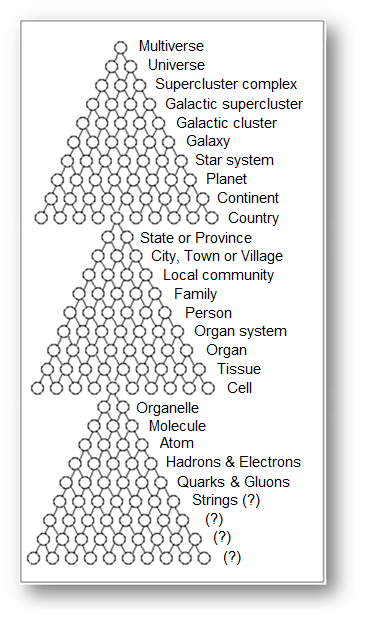 You’re a biological system, but, you’re part of many bigger social holon-partons (e.g. your family, the groups you belong to, and communities, and societies, nation/s, the global population). There are Three Laws of Holarchies: (1) Holon-partons compete and co-operate on the same level, (2) they look to integrate with holon-partons on the level above, and (3) They look to command and control holon-partons on the level below. This is how bio-cultural evolution works. These are just the laws of Physics, so I think EO Wilson was right in Consilience: The Unity of Knowledge (1998). Anyway, so StoryAlity Theory is a holarchy of ideas. Combine or `bisociate’ (another word from Koestler 1964) two adjacent ideas on the same level in the diagram above, and you get the idea directly above them. This is also called combinatorial Creativity (Boden 2004). So StoryAlity Theory includes Systems Theory (or, Cybernetics). Q: So, what’s a system? A: It’s a black box, with inputs and resulting outputs. Q: What’s inside the `black box’? A bunch of stuff. A Receptor (which receives information from the environment), an Alimentator (which receives energy from the environment). So for systems to work, you need (1) energy and (2) information. Then the Correlator stores the information. The Accumulator stores the energy. The Homeostat is like `the brains of the operation’ and it works out (or, `decides’) what to do with both of those things (the energy and information). Whether to store it – or use it to do something. Or a bit of both. Finally the Correlator sends messages to the Effector, which has an effect (a reaction, or an output) on the environment. It’s like a computer. For your computer to work (as a system) you need energy (say, electricity) and information (say, bytes of data, on the internet). The Correlator is like Computer Memory, and the Accumulator is the part that stores the electricity. The Homeostat is like the CPU (Central Processing Unit), and then the computer screen displays the output (or the effect on the environment). Also of course, there is a cooling-fan that removes excess heat from the computer. A homeostat is like a thermostat on an oven – or on an air-conditioner, or whatever. Anyway so that’s how Systems work. So is DNA. So is Culture, and so is Society. Lots of holon-partons, in a holarchy. Sometimes there are self-coupled systems, like Society and Culture. This is also why The Systems Model of Creativity (Csikszentmihalyi 1988, 1996, 2000) is important, if you want to understand why some movies go viral and others don’t. Note the word `Selection‘ in the quote above from Csikszentmihalyi (1999). He’s talking about the Evolutionary Algorithm (Selection, Variation and Transmission-with-heredity). Aka, BVSR (Blind-Variation and Selective-Retention theory). This is how both Biology (genes) and Culture (i.e.memes, or ideas, processes, and products) work. The evolutionary algorithm. Selection, Variation and Transmission-with-heredity. By the way `survival of the fittest’ just means `survival of the fastest-reproducing’. And in biology and in culture there is natural, artificial and sexual selection. And if you want to understand more of this, read the excellent work On The Origin of Stories: Evolution, Cognition, Fiction (Boyd 2009). 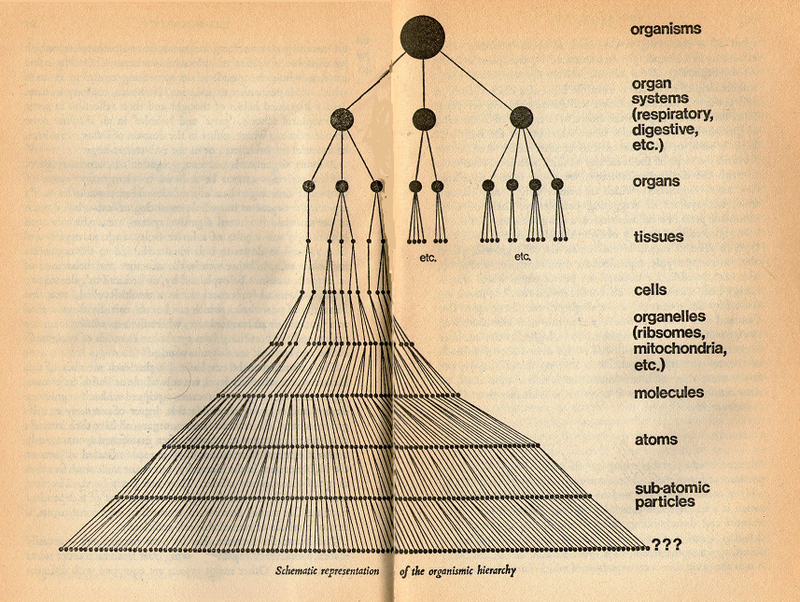 Anyway – here’s a picture from Koestler (1978) of a holarchy of systems. 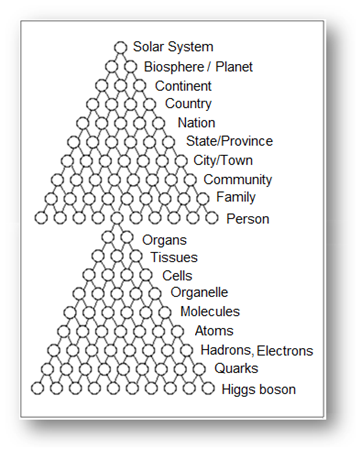 You’re like the `organism’ right at the top. Ecosystems are holon-partons, too. And you’re part of both of them (the biology and culture ecosystems, or the bio-cultural ecosystem). That’s also why, it’s dumb to pollute the environment, and to keep exacerbating human-made climate change, and why we should save the trees, and stuff. And that’s why, Everything Is Connected. 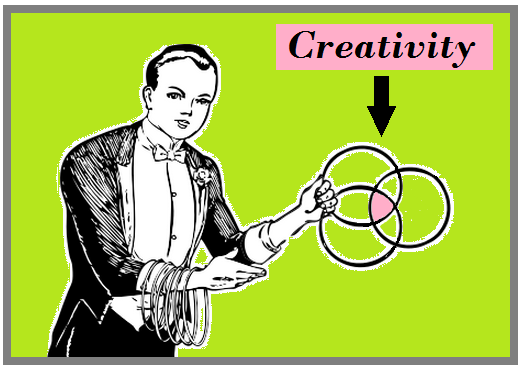 And if you want to see how Creativity works over time for an individual, see Creative Practice Theory. And, if you want to study this stuff more, read some of these fascinating books on Consilience. Also, that’s why – the unit of culture, the meme, is the holon-parton. Note that memes (ideas, culture) is at both the top and bottom of this holarchy below. And for much more on the same theory of cultural evolution, see Evolutionary Epistemology (e.g. Popper 1963). And see the evolution of The Systems Model of Creativity. And that’s why – Csikszentmihalyi’s systems model of Creativity (1988) and Sir Karl Popper’s (and Arthur Koestler’s and DT Campbell’s) Evolutionary Epistemology are exactly the same thing. They are just describing it in different words, and in different ways. But in a nutshell, that’s How Creativity Works. It works the same way in the Sciences, as in the Arts. See also my encyclopedia article on The Meme, the unit of culture. Niklas Luhmann (1987, pp 46-7) talks about “selection pressure” in culture, i.e. the Sciences and Arts. And I currently believe Luhmann’s theory of sociocybernetics (1984, 1995) is the same things as the systems model of creativity (Csikszentmihalyi 1988, 1996), and evolutionary epistemology (Popper 1963, DT Campbell 1974, etc). This `selection pressure’ Luhmann talks about is also what Van Peer (1997) discusses in the excellent article in Mosaic: A Journal for the Interdisciplinary Study of Literature, in `Two Laws of Literary History: Growth and Predictability in Canon Formation’ (1997). And – given systems theory (cybernetics) and holon-parton theory in bio-culture (Velikovsky 2013, 2014), this is all, therefore: a Grand Theory of Culture. In fact – it is a Grand Theory of Bio-Culture. And, it’s all because: Consilience. Creativity = Evolution. Creativity is a natural side-effect of the Evolutionary Algorithm. Creativity results from (is caused by) the `evolutionary algorithm’: Selection, Variation (Combination and/or Mutation), and Transmission-with-heredity. The ones that are better adapted at solving the problems of the environment (eg survival, reproduction or replication', etc) are new and more useful’. Guess what the standard definition of creativity is? `New and useful’!!! Say a new 100-metre sprint athlete is born, and trains hard, and is naturally talented (eg genetics) and becomes the fastest person to run 100m. – Guess what? They’re “creative” though we never think of it that way. But it’s the same. It’s evolution. SOme units are better adapted (solve the problems of the environment) better. So – it all works the same way (structurally and functionally) in Biology, as it does in Culture. Combine, two holon-partons (i.e. ideas, processes, products or memes, or, even systems) to get: another one. (Note: Combing two `old’ (existing) organisms [holon-partons] – or likewise – two `old’ (existing) ideas [memes, holon-partons] doesn’t always “work”… When this happens, and it fails, see: falsification. And likewise, if a new scientific theory is falsified, then it `dies’. If an artwork (e.g. a screenplay, a film, a painting, a novel, a song) is falsified, it `dies’. Thus – Behold, the Marvel of the Universe that is… Evolutionary Epistemology. Only 1% of Screenplays, that are made into Movies, break even. So – it appears Nature (and Evolution, or the `evolutionary algorithm’) runs on: ecosystems. What are `the 1%’, doing right-? See the Top 20 RoI Films for some extreme examples of `What to do right’. And so – What are the key `drivers’ of what gets selected? A: Human Nature, on a grand scale. (See: Evolutionary Psychology for more on: Human Nature. e.g. say, Buss (2012)). And so anyway – that’s, the holarchy of StoryAlity Theory. I kind of wish, it was all much simpler. It would be much quicker to explain to people. It’s only when we examine the parts that make up the whole (or the holon-partons!) it gets complex. By the way – the amazing genius Richard P Feynman invented the word `partons’ (1975) and, it means the same thing as Koestler’s word `holons’ – and, so – being a synthetic kind of a guy, I have synthesized it, into the word, `holon-partons’. And yes, `Culturology’ is a real word. (Seriously). PS – Also for more on systems theory, see this post on `Key Concepts in Systems Theory’ and also this post on `The Systems View of Life: A Unifying Vision’ (Capra & Luisi 2014). Boden, MA 2004, The Creative Mind: Myths and Mechanisms, 2nd edn, Routledge, London; New York. Csikszentmihalyi, M 1999, Implications of a Systems Perspective for the Study of Creativity in Robert Sternberg (ed) Handbook of Creativity Cambridge University Press, Cambridge. Csikszentmihalyi, M & Wolfe, R 2000, ‘New Conceptions and Research Approaches to Creativity: Implications for a Systems Perspective of Creativity in Education’, in KA Heller, FJ Mönks, R Subotnik & RJ Sternberg (eds), International Handbook of Giftedness and Talent, 2nd ed. edn, Elsevier, Amsterdam; Oxford. Dawkins, R 2006, The Selfish Gene, 30th anniversary edn, Oxford University Press, Oxford. Dennett, DC 1995, Darwin’s Dangerous Idea: Evolution and the Meanings of Life, Simon & Schuster, New York. Gleick, J 1987, Chaos: Making a New Science, Viking, New York, N.Y., U.S.A.
Koestler, A 1964, The Act of Creation, Hutchinson, London. Koestler, A 1978, Janus: A Summing Up, Hutchinson, London. Luhmann, Niklas. 1987 Soziale Systeme: Grundriss einer allgemeinen Theorie. Frankfurt/M. : Suhrkamp. Luhmann, N 1995, Social Systems, Writing science, Stanford University Press, Stanford, Calif.
McIntyre, P 2008, ‘Creativity and Cultural Production: A study of contemporary western music songwriting’, Creativity Research Journal, vol. 20, no. 1, pp. 40-52. McIntyre, P 2012, Creativity and Cultural Production: Issues for Media Practice, Palgrave Macmillan, Basingstoke; New York. McIntyre, P 2013, ‘Creativity as a System in Action’, in K Thomas & J Chan (eds), Handbook of Research on Creativity, Edward Elgar Publishing, Northampton, MA, pp. 69-83. Popper, KR 1963, Conjectures and Refutations: The Growth of Scientific Knowledge. (Essays and Lectures. ), Routledge & Kegan Paul, London. Sadowski, P 1999, Systems Theory as an Approach to the Study of Literature: Origins and Functions of Literature, E. Mellen Press, Lewiston, N.Y.
Simonton, DK 2012, ‘Fields, Domains, and Individuals (Chapter)’, in MD Mumford (ed. ), Handbook of Organizational Creativity, Elsevier Science, Oxford, UK, pp. 67-86. Suggested citation for this page: Velikovsky, JT, `The holarchy of StoryAlity Theory’, Storyality weblog, https://storyality.wordpress.com/ ,16th July 2014. Hey Devo! Hope all is great, and thanks for the good wishes. Re: the last 5 years, not sure about TV, sorry..! And, yes – always keen to chat. Drop me a line anytime – hope the new book is going great guns.